Tarot has been a part of my life, to some degree or another, since I was thirteen or fourteen years old. My first deck was given to me by a friend of my father’s – she was a reference librarian I also knew from her regular “shushing” of me and my friends. She adored B. Kliban cats, watched British comedies, and sang in the choir of her Episcopalian church. She was not exactly the kind of person one might expect to gift young teens with tarot decks. But, the truth is, tarot is often misunderstood, and those who have an interest in it often fall into some pretty silly stereotypes. When you think of tarot, you might think of cards you have seen in movies or TV shows. Often revealed by a fortune teller wearing jingly bangles and colorful scarves, are the Death card, the Tower, perhaps the Hanged Man or Three of Swords. Any cards that have ominous illustrations are favorites, because they tend to elicit a gasp, as well as immediate fear for the character receiving the tarot reading. Far from spooky, the tarot is simply a deck of seventy-eight cards (the number of cards may vary), illustrated with images full of symbols that evoke response. Our response to those symbols may be emotional or rational, based on personal memory or experience, on what we have learned, or on societal conditioning. Additionally, symbols in tarot generally do carry with them rather specific meanings that we should take into account. For example, a star symbol will be recognizable to all of us – for each person, the symbol will have its own meaning – or perhaps none at all, which might affect how we feel about the card. 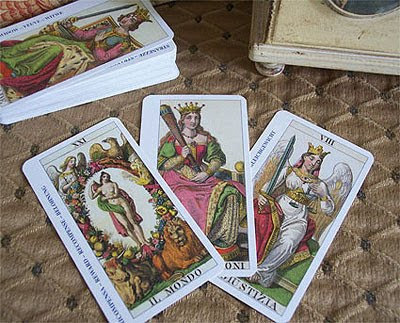 But, appearing on a tarot card, a star will also have its own meaning, or meanings… depending on what the designer intended, as well as what it might mean historically and metaphysically. Tarot today can be helpful in sorting out our personal messes, to put it rather bluntly! Turning to the cards is simply another way of gathering some advice – advice that we find in reflecting on symbols and images that are often cross-cultural, and therefore somewhat universal and timeless. This symbolic language makes sense to us. We can find meaning and insight in the cards that can help us make decisions regarding our daily lives. Readings can help us gain understanding about ourselves and the challenges we face. I personally do not believe there is any power to the cards – the power to discern and interpret meaning is our own, the power to apply what we learn to living better lives, is also our own. If you are interested in learning more about tarot, I’d like to suggest some books you might enjoy. We plan on offering a blog series on tarot here at Mind Body Spirit, so please let us know if there are any specific topics you would like to see discussed. Seventy Eight Degrees of Wisdom by Rachel Pollack is an in-depth exploration of tarot that is accessible to beginners, and it offers significant insight to seasoned practitioners as well. Another book by Rachel Pollack is Complete Illustrated Guide to Tarot offering a general outline of tarot, the history of tarot, standard meanings of each card, and ways to use the cards in readings. Mary K. Greer’s Tarot for Your Self is a workbook designed for the beginner. If you like learning through self-directed exercises, this may be just the book for you. Pictures from the Heart – A Tarot Dictionary, by Sandra A. Thomson, is a great book to have on hand to look up the possible meanings of specific symbols on the cards. I am so glad I came upon your blog. Thank you for addressing the beauty of the Tarot. It is, indeed, powerful and always offers a new perspective. 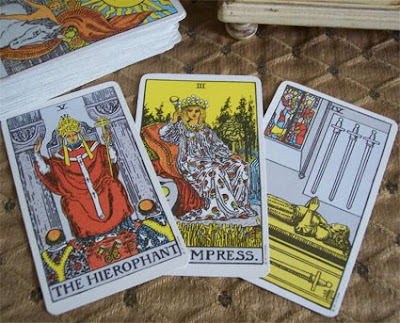 The most popular version of the Tarot was established in 1910, by the artist, Pamela Colman-Smith. She worked under the guidance of occultist A.E. Waite. The Waite deck was the first tarot deck to included symbolic imagery on all 78 cards. The tarot’s symbolism is based on archetypal elements and metaphors, so its imagery has a universal appeal. With that being said, the imagery of the tarot has its roots in many different philosophical and religious backgrounds. There are 22 tarot cards in the Major Arcana. I believe the Major Arcana reflects where one is in his or her life’s journey. The first half of the Major Arcana identifies the transition from child to adult and all of the challenges we must face as we progress into a deeper level of maturity and spirituality. The second half of the Major Arcana reflects our personal and spiritual world view. In most tarot card readings, the second half of the major arcana typically points to a more inward-looking stage in our development and, please keep in mind, this does not always happen in procession. becoming a new owner and an ivester along with god bond insurances. I need a porforlio tarot card holder company. after going threw a full stars alignment very powerfull time of life. followed by a corporate (card) of disastor(ruled by a church) No thanks. did not help things..
i have in my post library commerce suported some clauses that I need to uphold on my own behalf. so I have chosen tarot..
i also am working with- on world payment solutions so its a big deal at this point to gain the suport threw such a.org like your self.. If you send me the proper forms that meets ower criteara. I will send the numbers needed.